The pictures are copied from the Internet. In addition, these days, one of the hot topics online in China is about the millitary review of USA across Yellow sea. The opinion that USA threatens China is spread, and some Chinese worried about that one day USA would attack China. Btw, it's also a good way for the local government to move the people's focus off the corruption etc. by spreading this opinion. There is a posting that can be the most sarcastic black humour of all the postings about this disaster. The posting said, "当时，我正开车在栖霞大道上，离事发地点二百米左右，突然一声巨响，马路上所有车一震，远方升起蘑菇云，我心里一凉，美国人终于对中国下手了". In English, it means,"at that time, I was driving along Xi Xia Road, about 200 metres away from the explosion, suddenly, a blare, all the cars on the road were shaked, then a mush cloud rose at a distant location, my heart got frozen: Finally, Americans attack China!" M: have u seen my posting about "US attacks China"? M: can you understand it? M: yeah, but you can't understand its humour of "US attacks China". M: I mean the humour of this posting: at that time, I was driving along Xi Xia Road, about 200 metres away from the explosion, suddenly, a blare, all the cars on the road were shaked, then a mush cloud rose at a distant location, my heart got frozen: Finally, Americans attack China! M: that factory shouldn't be located in a living area, but it was, and some people believe that there was some corruption about it. M: meantime, in order to move the focus of people off the corruption etc. some people like to say that US threatens China. China isn't safe. 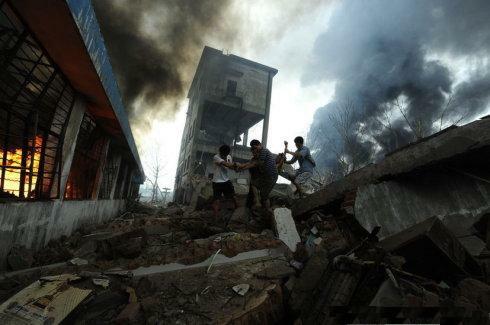 M: Now the factory exploded and killed a lot of Chinese people. M: now can you understand it? M: nothing about USA in this accident. M: Just so you know, there are severe contradiction between Chinese government and Chinese people. the government likes to indicate that USA threatens China. They hope that the people won't blame the corruption of the gov in this way. 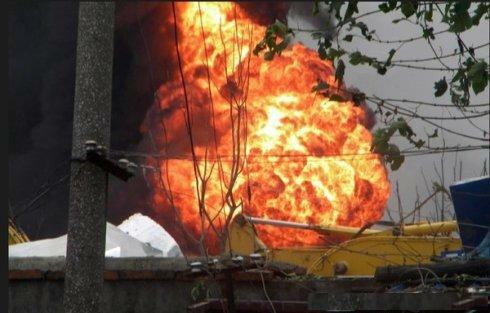 M: now the factory exploded and killed a lot of Chinese people. it shows that the corruption threatens the life of Chinese people, not USA. U: well...me and some friends wanted to take a tour of the Belsen concentration camp...where many Jews died. M: do you mean they will ground you all in it.